Brick Bender: Minifig or Miniland? Scale is as important to a LEGO builder as the finest butchers or postmasters. So much of what one builds is largely determined by the amount of LEGO bricks in your collection, or perhaps more importantly, the amount in specific colors. And that brings us to one of the more interesting choices- should a building or vehicle be built to minifig or miniland scale? Minifig scale means that height and width are loosely matched to the ubiquitous LEGO minifig as a tiny driver or resident of a given structure. This is the universe of six-wide vehicles, referring to the number of studs, and traditional town and train displays. 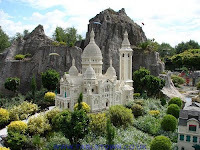 Miniland scale (extensively discussed in Allan Bedford's The Unofficial LEGO Builder's Guide) is larger and corresponds to the actual size of objects in our world. Miniland at LEGOLAND themeparks is at a ratio of 1:20. Here you see the block head style figures and vignettes that closely mirror real-life interactions. A lot of builders grow into Miniland scale as their collection increases and their desire for more detail has them constructing larger MOCs (my own creation). "50 Years of the LEGO Brick"
Can you build an escape plan out of LEGO bricks?